This picture illustrates what a menace cheater pints are, though I wish it had a better view of the glass bottoms. 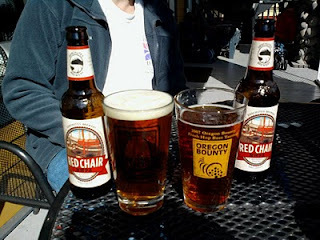 These are two sibling 12-ounce bottles of Deschutes Red Chair, one poured into the cheater pint glass on the left, the other poured into the 16-ounce pint glass on the right. For some reason the pint glass pour didn't get a head on it, either because there was water (soap?) on the glass, or because I instinctively used the no-head pour I learned in college instead of the modern beer-geek style. But look at Dave's cheater glass. If you get a cheater pint with a one-finger head that reaches the rim, you've been served a 12-ounce beer. Cheater pint + head = 12 ounce beer. Jeff has local news video from my dear home state of Oklahoma, where some local ladies sporting pink Honest Pint Project T-shirts are patrolling the bars of OKC. Alan ran across an article in PMQ Pizza Magazine -- too much free time, Alan? -- advising pizzeria owners to take advantage of the "evolution of the 14-ounce pint glass". 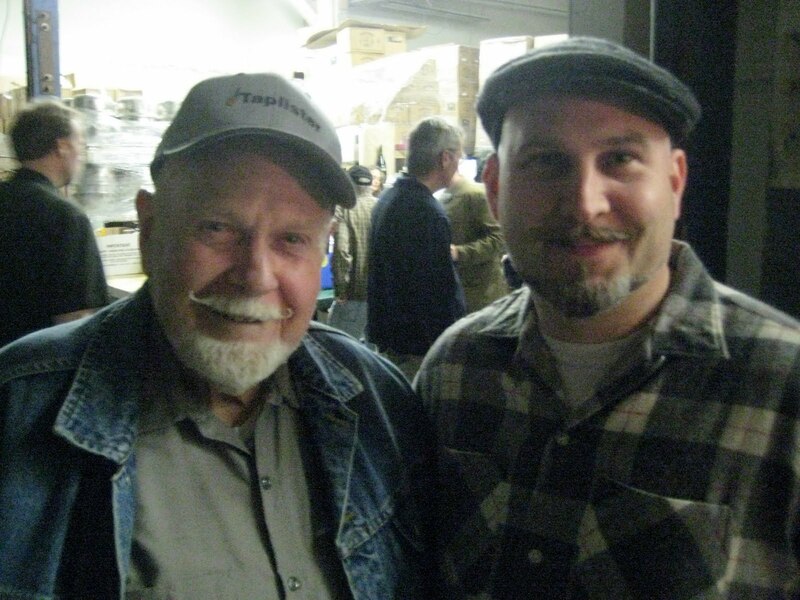 The purveyor of the most honest pints in Oregon, Ted Sobel of Brewers Union 180, is in Portland for rare appearances tonight (Thursday, May 27) at the Green Dragon, and tomorrow at Belmont Station. Since Ted's cask beer is only available in Portland when he himself delivers and serves it (! ), you should try and get out to one of these tastings if you can. Too bad the Green Dragon doesn't serve honest pints -- at Ted's pub in Oakridge the English pint glasses have a fill-line marked at 20 ounces -- but at least you're guaranteed 16 at Belmont Station. The laughable spectacle of Charlie Papazian's online poll to determine Beer City, USA has ended in only the second-worst outcome for Portland. The most terrible thing that could have happened would have been for Portland to edge Asheville, NC by a few votes, so that it would have been us wearing the propeller beanie and not them. (Photo credit: rbatina.) 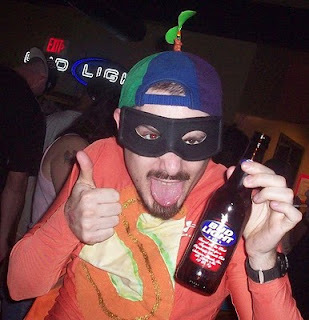 In a contest to see who has the most insecure beer fans, it's better that we should come in second place than to suffer the humiliation of actually winning the prize. If Portland had barely lost to a real adversary, like any of the cities listed here, or even had we been blown away by one or two of them, there would be some honor in that. Instead, we only look pathetic, jumping up and down for attention on the internet. The only consolation is that tiny Asheville -- which for all I know is a fine place with wonderful beer -- looks even more pathetic than we do. This week I was in the Silicon Valley for work. Not my favorite place in the world, but I was determined to make the best of it. The rental car place had upgraded me from a Hyundai to a Cadillac, so Monday evening I decided a drive to Santa Cruz was in order. Beermapping.com recommended that I hit Red Restaurant, and I was really glad I did. The place had a great laid-back atmosphere with lots of couches spread out around a cozy room, and a wonderful tap list of about 30 beers The goblet of Lost Abbey Angel's Share in the picture only set me back $5.50. Friendly service and serviceable food rounded it all out. If you're headed there, don't be confused by the ground floor -- a burrito place and a smoky bar called the Red Room -- find the stairway outside that leads upstairs to the Red Restaurant. 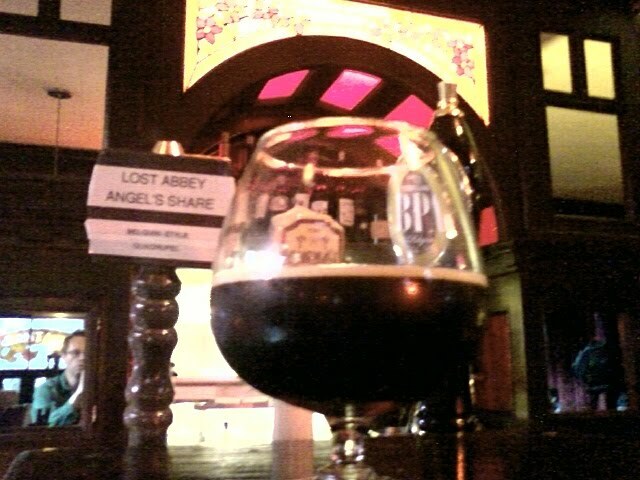 That Angel's Share was a thing of beauty: dense toffee flavors with a boozy brandy edge, balanced with unobtrusive hops. Despite what a big beer it was, it wasn't at all cloying. I would have drunk one after the other if I didn't have to steer a land yacht 40 miles through the rain on winding mountain roads to get back to my motel. Back at the motel, a Unibroue Maudite -- a Belgian-style beer that I usually love, and which garners an A- on Beer Advocate -- seemed syrupy and one-dimensional compared to the memory of the Angel's Share. Tuesday evening I took Caltrain up to the City to hang out with our friend Andy and check out a couple of North Beach places that I hadn't been to. La Trappe is a Belgian-themed beer-snob favorite that I was embarrassed to have missed during our family vacation in March. With my sights set on La Trappe, Beer Advocate came up with another North Beach gem to try: Kennedy's Irish Pub and Curry House. Kennedy's has a respectable 30-some-odd beer taps, but I was also interested in the Indian-food angle of the place. I figured the menu would consist of British-inflected curries, but when we got there I was surprised to see that in addition to the standard fare, they also served South Indian dosas and utthappam. This was a bit of overkill for me -- I had already had a huge pesarattu dosa with upma for lunch that day at Dosa Place in Santa Clara -- but there is so little in the way of good South Indian food in Portland that I was happy to repeat myself. 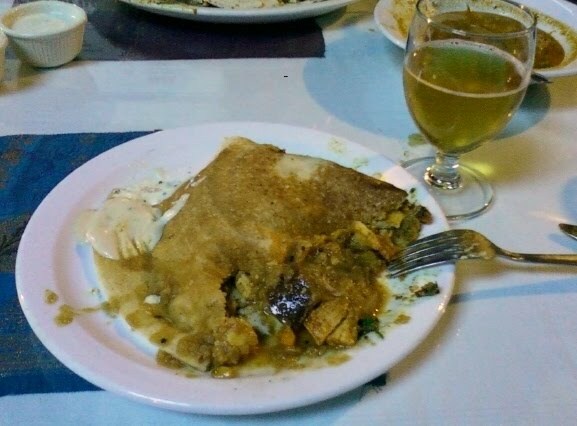 The Kennedy's dosas were not exactly kosher: in fact we ordered a spicy chicken dosa and a lamb utthappam. Those are odd variations on a basically vegetarian cuisine, but they were tasty enough and a welcome departure from usual bar food. If you go there, one dosa is enough for two people. The schizophrenia at Kennedy's doesn't end with the Irish-Indian juxtaposition. There's also sort of a sports-bar vibe to the place, with TVs in every corner, and pool, foosball, and air hockey. Andy was excited when we ambled up to the door -- "This is one of the last bars in San Francisco that has air hockey," he said. If that wasn't enough, on our way out we discovered that one room in the place is now a wine bar with rotating exhibits of modern art, and local meet-the-winemaker events. With something for almost everyone, Kennedy's is definitely a place to check out. Full of spicy food, Andy and I made our way over to La Trappe. There was a kind of resonance with my Red Restaurant experience: the cellar dining area of La Trappe has a similarly dark and relaxed ambience, and even has a little candlelit cove of couches and coffee tables if you are just there for a beer or two as we were. 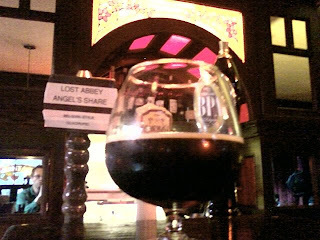 What really resonated with me was that they also had Angel's Share on tap, though at a more diabolical big-city price of $8, for a less generous pour than the one I had the night before in Santa Cruz. I was really happy to get another shot at such a wonderful beer that isn't available in Portland. Andy ordered a Kwak that was served in one of the more ridiculous pieces of glassware ever seen -- a round-bottomed beaker that rests in a cheesy wooden stand. Good beer, and a really fine atmosphere that left me wishing I had more time and money to spend there. The beer tourism was a welcome relief from the woes of business travel. I highly recommend La Trappe and Red if you find yourself in SF or Santa Cruz respectively, and Kennedy's is a fun, funky place that I expect to return to again. And take as many shares of Angel's Share as you can get -- it's a stunner. Way back in February I was the undeserving recipient of some amazing Canadian generosity when Ryan O'Connor, who edits the CAMRA Vancouver newsletter, bestowed on me a tasty assortment of some of his favorite British Columbia craft beers. 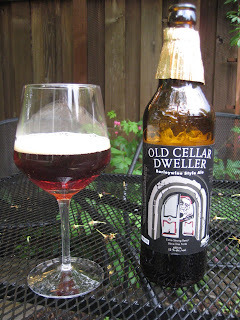 He recommended that I not sit for too long on the two bottles of Old Cellar Dweller barleywine from Victoria's Driftwood Brewery, as part of the attraction was the "big, sticky, resinous hop nose", which he said goes away with just a little age. It was a good call. When I opened a bottle of Cellar Dweller at a neighborhood poker game a couple weeks after Ryan gave it to me, it was a big hit. We also tried another barleywine that he brought with him, the Old Bad Cat from Fat Cat Brewery in Nanaimo, BC. The Cellar Dweller's tons of malt and hops blew away the Bad Cat, which was merely syrupy in comparison. Last week I opened the other bottle of Cellar Dweller so I could give a slightly more descriptive report than "tons of malt and hops". The bottle was at room temperature, and the hop aromas may have faded a bit, because strong alcohol was the main component in the nose this time. Flavorwise, it has lots of everything, all balanced well against one another: brown-sugar (or even burnt-sugar) malt, lots of bitter, orangey hops, and a little alcohol sting (it is 12%). It was pleasantly viscous, with a hoppy/roasty finish that didn't overstay its welcome. This time Dave, Carla, and I compared it with a year-old bottle of Sierra Nevada Bigfoot, and the fresh Old Cellar Dweller won hands down. The hops in the Bigfoot were bitter but losing their floral qualities, and the body just wasn't as full as the Driftwood. Ryan also brought some cans of Red Racer IPA from Central City Brewing in Surrey. It was a very nice, big IPA, plenty of hops but not over the top. He also dropped some off with Ezra, who describes it in more detail in this review, as well as comparing it to Bear Republic's Racer 5. 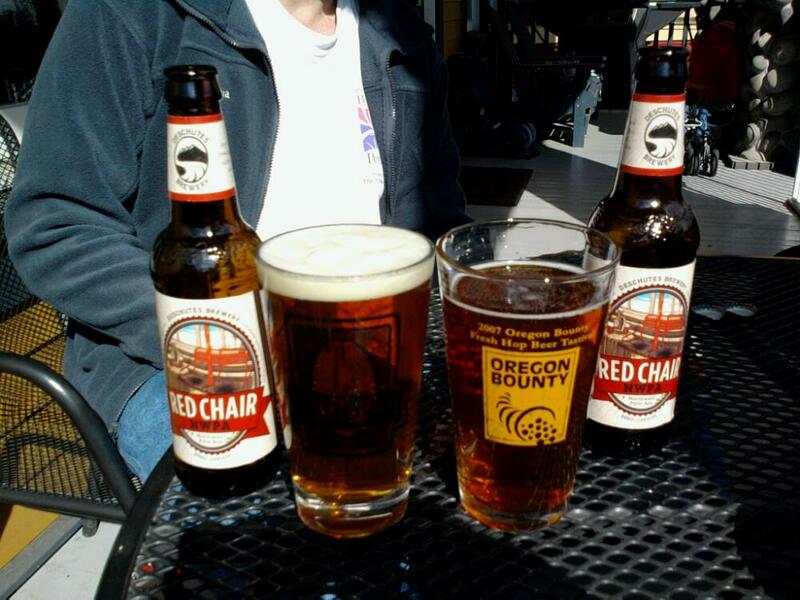 Ezra also reports that Bear Republic has sued Central City, claiming that Red Racer infringes their Racer 5 trademark. Don't you think the world would be a better place with fewer lawyers in it? Anyway, many thanks to Ryan for the unexpected beer delivery. And definitely seek out some Old Cellar Dweller or other Driftwood beers if you find yourself in the Great White North. 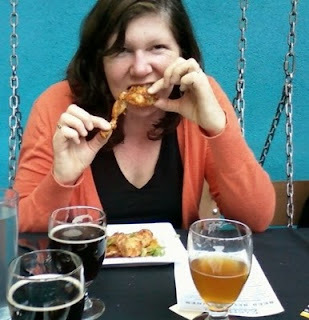 Had a great time Saturday at Hopworks for the 4th annual Portland Cheers to Belgian Beers festival. The upper parking lot was bustling with jovial beer drinkers, but it wasn't over-crowded like a couple of years ago when the Fresh Hop Festival was held at the same venue. The weather was just right, lines were never long, and as far as I know, there were no beer outages by the time I left about 4 PM. There was a nice variety of mostly good beers, tasty snacks in the $3-$6 range were served at the top of the lot, and alphabetical order was adhered to pretty closely. In short, it was everything you could hope for in a beer festival. Congratulations to Hopworks, the Oregon Brewers Guild, and everyone involved for a job well done. Pretty near everyone I talked to got the Widmer table beer as their first try, since it was a very tame 3% alcohol. Lots of people have noted a growing trend of trying to produce flavorful beers with lower alcohol levels. It's a worthy endeavor, and the Biere de Table was a great example of a light, refreshing, food-oriented beer. Along those lines, the 4.8% Tropisch Bruin from the Deschutes Bend brewery was also a pretty nice table beer, I'll give it a B grade. Cascade's Frite Galois was a 4.6% sour ale that had some nice flavors, but had a chalky finish that I didn't care for. It gets a B- from me. I listed the Big Horse sour in first place above -- I thought it had the best-balanced combination of interesting flavors -- but as I left the festival I cast my ballot for the Upright Farmhouse Brown, partly out of personal loyalty to Corey and Alex, partly out of the calculation that I didn't want to risk sending the festival to Hood River next year. It wasn't much of a stretch, it was a fine beer. I also think that aging will make Mingus and Monk into an even nicer beer than it was Saturday, and I suspect that Alex will oblige us by bringing a little out at a time as the months go by. 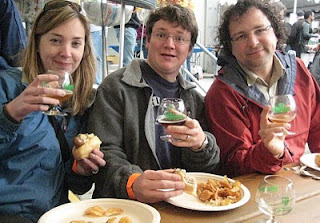 In fact, a lot of the beers at the festival would probably benefit from a few months' aging: I especially thought that the Oakshire and Green Dragon entries were not yet at their best. It was kind of a common refrain in talking to people about the beers -- "I'd like to try this again in a few months". Talking to Derek and Josh at the festival, they had the idea that this year's winner should announce next year's yeast immediately to give brewers more time for experimenting and aging. One of them even proposed scheduling out the yeast several years ahead of time, but I'm not sure the brewers are taking the event quite as seriously as the rest of us are. To fill in some of the gaps I left in the list, and for valuable second opinions, check out the writeups by other Portland bloggers: Dr. Wort, Derek, Jeff, Angelo, Brady. Update: The People's Choice winner has been announced: Block 15 Ferme de Demons Black Saison. Congratulations, Block 15! Definitely one of the most creative breweries in the state, though I'll admit that Ferme de Demons was one of my least favorites of the festival. Now the big question is, where will the CtBB be held in 2011?